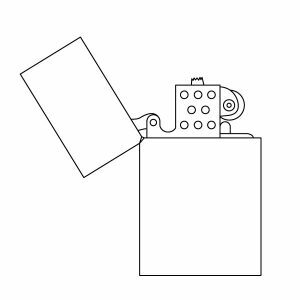 If your Hard Edge lighter is having trouble lighting it is time for a little loving care and maintenance. Make sure that the wick is protruding from the top of the flame wind guard (See diagram below). If the wick is below the flame guard, using a pair of pliers grasp the wick and pull slowly until the desired length is obtained. Make sure that the length of flint is sufficient to produce sparks. If not replace the flint with a new one. Remember that flints are consumables and need replacing at regular intervals! Now make sure there is sufficient lighter fluid. If the cotton wadding appears white add a small amount of lighter fluid and stop then repeat this process until the cotton wadding has a slight grey appearance. This indicates that it has sufficient fluid. After filling, wipe lighter and hands dry before igniting. Make sure that the flint wheel is free of debris. This can be done by using a small brush to clean the wheel. An old tooth brush works well for this purpose! Your Hard Edge should be ready!